Carmarthen TownCarmarthen is a very popular retail centre for the surrounding area, offering a blend of high street names and independent boutiques that reflect the town’s commitment to the future and its respect for the past. On the banks of the River Towy, Carmarthen claims to be the oldest town in Wales and the birthplace of the wizard Merlin. Whether this is strictly true or not, Carmarthen has certainly been around long enough. When the Romans marched into Carmarthenshire they establisehd a sea fort called Moridunum where todays town stands. Since then it has played an important role in the Arthurian legends, been colonised by the Normans, laid low by the Black Death and experienced the highs and lows of the mining industry. 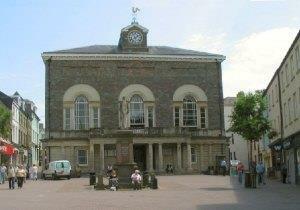 Carmarthen’s principle civic purpose however, has always been as a judicial centre. Today visitors can take in this rich history whilst strolling the medieval lanes and alleys of the walled Old Town, by visiting the Carmarthen Museum in Bishops Palace or by taking a trip to see one of only seven remaining Roman amphitheatres in Britain. Attractions that should not be missed include the Oriel Myrddin Gallery, the art deco cinema, St Peters Church, Carmarthen Castle, Llanstephan Castle, Laugharne Castle and the renovated Market Hall. Carmarthen also boasts an outdoor velodrome for any budding Bradley Wiggins or Victoria Pendletons, as well as Carmathan Golf Club, winner of the Welsh Golf Club of the year 2011. Famous sons of Carmarthen include the architect John Nash, ex Wales rugby captain Stephen Jones and comedian Rhod Gilbert. Carmarthen is a very popular retail centre for the surrounding area, offering a blend of high street names and independent boutiques that reflect the town’s commitment to the future and its respect for the past. Carmarthen has a railway station on the West Wales line between Swansea and Fishguard.